LIGHT FLUX EP NEW !!! 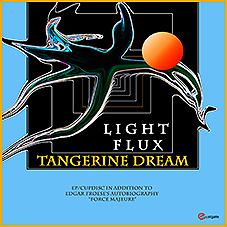 The LIGHT FLUX EP is the SINGLE RELEASE of the full album LIGHT FLUX and is an additional bonus for all the fans who took part in the PRE-SALE of the FORCE MAJEURE book, Edgar's autobiography on Tangerine Dream. GREEN SUMMER CLOUDS is a completely new track of about 18 min composed by Edgar and Thorsten and the others are newly arranged. Enjoy a wonderful EP of TD music while reading the autobiography!